Ananta Burin Resort located on Ao Nang Beach, Krabi. Only ten minutes walk, you can enjoy your day with Ao Nang Beach that amidst the white sandy, islets, coral reefs, rock formations, limestone caves and clear waters of the Andaman Sea.We offer you with 75 Thai modern accommodations of Superior, Deluxe pool view, or Deluxe pool access. Friendly staffs and nice environment of Ananta Burin Resort will create you a memorable holiday. Also we concern every single point of decoration to provide you with feeling of luxurious, comfortable, and pleasant atmosphere. Beautiful bathrooms and private balconies allow you to have a nice relaxing and sun-basking on your wonderful holiday. . 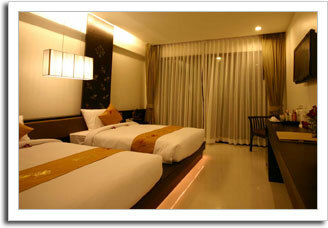 The above room rates are net per room per night and inclusive of service charge, applicable vat and American breakfast. Maximum 1 extra person in each room type. Minimum stay 2 nights for period 20 Dec – 15 Jan .